Dwarf Woodlands is the world based on Snow White & The Seven Dwarfs. It was the first feature length Disney film ever made and also the first Disney film I'd ever saw as a child. The Queen was one of the most terrifying characters to me. Both her design, voice actress, and presentation always scared me as a child. Even to this day as a 21 year old man, I still find her and many other aspects of early Disney films to be very strange and off putting. Her transformation scene, her interactions with the mirror, and the way she almost breaks the fourth wall and talks directly to the audience about her plans once she's become the old hag were major examples of what scared me. 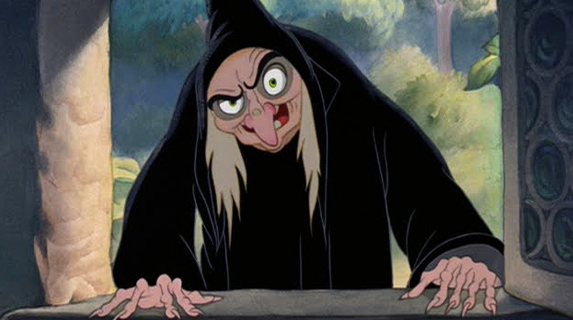 I've actually heard rumors that Walt Disney designed her intentionally to try and have children become scared of elderly Jewish women, because you know, he was apparently an anti-semite. lol, I know that's most likely crap, but I thought I'd throw that out there. regardless of the Queen/Old Hag, the potential for the world was never delivered on in my opinion. Its also the home of one of the 3 main Princesses of Heart and while Birth By Sleep explored all 3 of their worlds, it never dedicated enough time and universe building to make them stand out. There's never a boss fight with the Queen herself, the Mirror is used twice, but I'm fine with his inclusion. The problem is he's this powerful magic entity that can answer any question and that plot device is barely even contemplated on by our main characters. Terra uses it, but it only slightly foreshadows future events and really not anymore so than any other world in the game. I honestly feel this world should have been explored in more depth and respect than how it was handled in Birth By Sleep. Both the Queen and The Magic Mirror should be as important or more so important than Maleficent, it would have been the perfect opportunity to make the Disney villains relevant and threatening again. Birth By Sleep tried to provide that with Enchanted Dominion but only slightly played with the idea after Maleficent's character had already been tainted by her Team Rocket portrayal with Pete in KH2, which pretty much used all the Disney worlds and characters in that way. Its like the developers after KH1 decided lets throw some deviant art anime rejects into the mix and forget the Disney charm. Don't get me wrong, I love the Organization', but their inclusion into the series, especially in KH2 detracts from Disney's importance into the series and even when they are removed from the equation like in BBS the worlds still feel like filler clinging on to their muddled universe building attempts and potential. The home of the first Princess of Light, The Queen of Evil, and The Magic Mirror of Answers should have been represented in a way that brought the importance of Disney back to Kingdom Hearts, Instead its just another filler world in the ever growing catalog of those in the Kingdom Hearts series. You make many good and true points here. Especially with the Magic Mirror not being valued much by the main charterers despite it's power. I loved but but still was disappointed with Dwarf Woodlands, mostly with how the queen was portrayed. That and Terra's stupidity in just letting her go after knowing she is a horrible queen and is trying to kill an innocent girl. And Aqua's rehash of the boss battle. I completely agree with you, especially with Hunchback of Notre Dame. Its an incredibly dark and serious Disney film and its treated like a glorified RPG side quest in DDD. I'm hoping they'll bring back HoND in KH3 just for the sake of making it better than they did in DDD, even if it gets in the way of the convoluted sleeping worlds thing. But if it doesn't (most likely won't) then oh well, the potential of it is gone forever. They really need to make the worlds true to the character and heart of the films, which is supposed to be the entire point of this series, Disney + Final Fantasy-inspired original characters. it won't get in the way, the worlds were sleeping and now they're awake. that would mean that everyone is alive and well with the memories of what happened. Isn't it like this for 90% of the worlds in Kh anyway?Maybe better hardware can change things..i hope. I don't think the story of each world has to be AS intense as the disney movies. How much time do you spend in a world except battles and stuff? Some cutscenes-long. Of course it won't be the same as the movies. they mean how the world was just wasted. in BbS, the worlds took only 30-45 minutes to complete back in 2010 (granted i was a high level). the only reason they were in was to say "hey guys! look! this game is a prequel!" and the PSP's hardware didn't allow for much. I think there's at least some potential for this world to come back. As well as any of the other worlds that a princess of heart comes from. Aren't they a significant plot point for KH3? maybe just a highlight reel of flashbacks or quick visits via portals somehow. So we agree. There is some potential for those worlds to return but they definitely don't have to for story reasons. Also now that I think about it it's probably not likely. Nomura has said that most of the worlds are going to be new. We already know Twilight Town and Olympus Coliseum are coming back so it seems to me that there probably only going to be 1 or 2 more returning worlds. I doubt they would bring it back. he didnt say that, he said many worlds will be new and every map will be new. basically, everything is being built from the ground up.